It's looking good though, isn't it? The good news is that I know for sure that I can run the Mk2a on 2.7-3.0mm filament without having to tweak anything at all. We should be OK. I'll put the Zaphod rig back together and await samples. Do we ahve a feel for the eventual cost of this stuff? It's USD$4/lb for a 20kg bag of pellets. Forrest said Jim Waring of New Image Plastics is offering us a production rate of US$3.75/lb for short production runs from 1 lb on up. 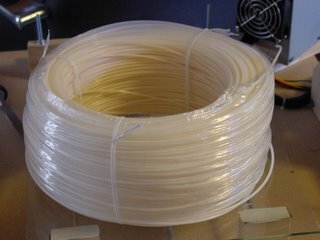 US$8/lb (~$US17.50/kg) , not including shipping from Solvay to the filament processor, and shipping from the filament processor to your doorstep, I suppose. Processing the stuff in the workshop is starting to look pretty attractive. As we go for bigger orders and production runs those costs will decline by about a third, I would guess. The big cost is transport. When Walmart and Home Depot starts carrying CAPA filament we can expect very good prices. As well, if we are able to go over to HDPE and polypropylene, you could see the basic price to be half of what we are getting.